The New York Knicks continue to look for potential trade partners in a Carmelo Anthony deal, and according to the latest NBA trade rumors, the Cleveland Cavaliers are not interested in sending Kevin Love to New York. The Carmelo Anthony saga may be nearing an end for the New York Knicks, but it’s Carmelo himself who will decide exactly when it might end thanks to the no-trade clause the Knicks gave him in his big contract a few years back. That means New York has to find a trade that Carmelo will like if he’s to allow it to go through. There aren’t that many teams that seem like good fits for the aging star forward, although getting to play with good buddy LeBron James sure is appealing. One of the bigger reasons the Knicks continue to make calls to the Cleveland Cavaliers has everything to do with LeBron’s presence there. Melo isn’t going to buy in on getting traded to the Charlotte Hornets or somewhere outside of a major market — unless someone like LeBron is already on that team. Hence the Knicks continually calling Cleveland about the possibility of a Melo-for Kevin Love swap, according to the latest NBA trade rumors via ESPN’s Ramona Shelburne and Marc Stein. According to the piece, the Cavs are one of just three potential destinations Melo would consent to being dealt to. The others are the Los Angeles Clippers and the Boston Celtics. L.A. won’t give up any of their Big Three, meaning the best player who could move in a deal would be J.J. Redick, who is on the last year of his contract. The Celtics have tons of trade chips, but can any defense survive Isaiah Thomas and Melo both playing starter’s minutes without a rim protector around? That leaves Cleveland as likely the most logical fit, aside from the matter of who the Cavs send back. 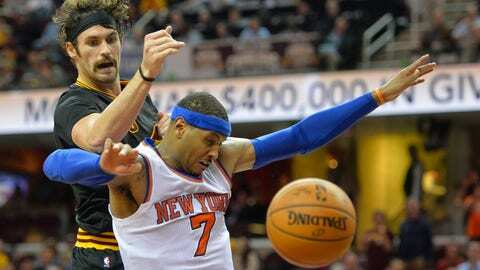 The Knicks want Love, but Cavaliers GM David Griffin is rightfully not interested in a Love-for-Melo deal. Kyrie Irving isn’t up for grabs either, meaning the Cavaliers also will not break up their Big Three to make a deal for Melo work. The other players in Cleveland getting paid are Tristan Thompson, J.R. Smith, Iman Shumpert and Channing Frye. Nobody else on Cleveland’s roster makes more than $5.3 million this season. Thompson isn’t getting moved — he’s the Cavs’ only real center at this point. Smith is hurt. Shumpert is having a good season, but he makes a fraction of what Melo makes and he’s not worth enough on his own to swing the deal. The same goes for Frye. This makes a deal tough to work out. The Knicks are including third and even fourth teams in these trade talks, because they have to make salaries work and ensure everybody is happy. Doing so is apparently difficult, considering Melo needs to be one of the happy parties in order for him to ignore his no-trade clause. From everything that’s been reported so far, neither the Cavaliers nor the Clippers will part with any of their most valuable players. It’s doubtful that Boston would consider dealing either of their remaining draft picks from the Brooklyn Nets as well. That leaves the Knicks in the non-desirable spot of desperately wanting to sell with no obvious buyers popping up who are interested in paying what New York wants in return. Carmelo’s no-trade clause only makes things tougher. The New York Knicks are still very interested in trading Carmelo Anthony, but any potential haul may not be that great according to the latest NBA trade rumors.